Torrington apartment building in GTA LCS. The Torrington Apartments is a 206,5 m (677,5 ft) high-rise skyscraper which serves as the departments in Downtown of Staunton Island at Liberty City in Grand Theft Auto III, Grand Theft Auto Advance and Grand Theft Auto: Liberty City Stories. The skyscraper is located on the district of Torrington, next to the 366, one block from The Big Shot Casino in territory controlled by the Yakuza. In GTA III (2001) does not matter, but in GTA LCS (1998) is inhabited by Toshiko Kasen who engages the services of Toni Cipriani to ruin their business and plans her spouse. This building is where Toshiko Kasen commits suicide after having been completed sending missions to Toni. The appearance of the building mostly seen from behind is like the 1095 Avenue of the Americas, as well as color. 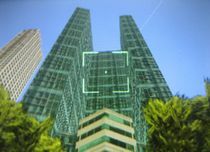 At the bottom of the image can be seen the building in GTA III. interior of Toshiko's apartment in GTA LCS. This page was last modified on 2 October 2013, at 23:22.